The biggest piece of furniture in a room is usually the sofa. By the very nature of size it will make a statement, so what does your sofa say about you? Are you telling your family and guests that this room is for relaxing, or is it about your design style? Of course, everything else in the room will contribute to your style statement as well, but the sofa is the starting point. 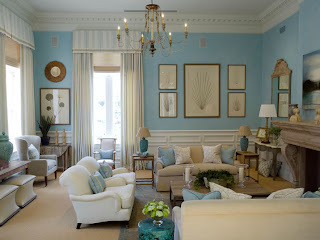 This living room designed by Mrs. Howard is classic and inspired by English country house decorating. The sofas are welcoming and comfy. Great places to sit and have a long conversation. This lovely settee is almost the opposite from the inviting English sofa. 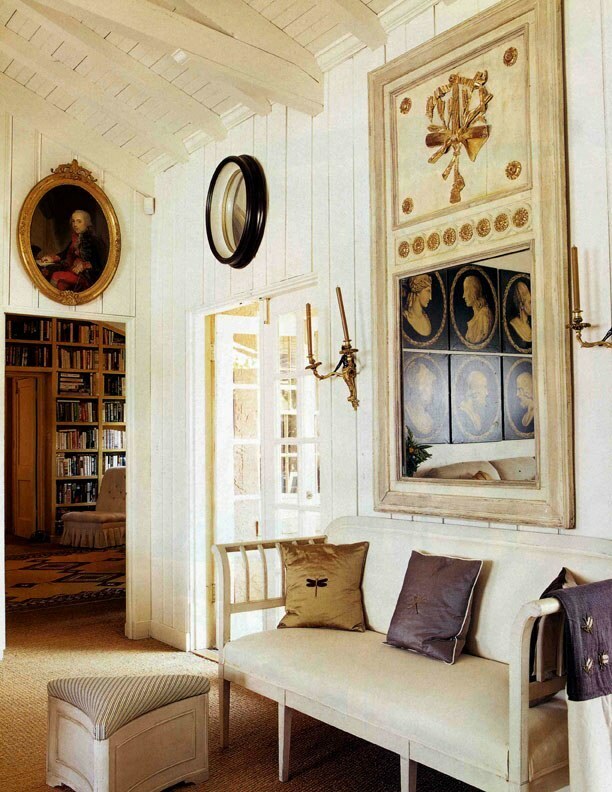 It's more formal and sets the Swedish style in this room. It's a nice place to rest for a moment or two, but probably not the place to sit for an afternoon with a good book. There is something about the graceful curves of a Regency style sofa. It combines sculptural form with comfort. This living room designed by Darryl Carter mixes some wonderful antique pieces with a modern coffee table. Upholstering the sofa in white makes the wood curves pop. I love the whole look and could move in tomorrow. I love both of these sofas being offered at the Stair Galleries auction tomorrow evening (Oct. 8th). They would be a style statement, and a nice place to sit too! The top photo is Lot 105 and is described as a Biedermeier style sofa, and has an auction estimate of $1,000 - $1,500. It's made of a lovely ash wood, and I even like the red and white striped upholstery. The bottom sofa photo is Lot 175A and is described as an American classical-style carved mahogany settee. It has wonderfully carved feet, and great curves. I would upholster this in white canvas like the Darryl Carter one above, and add a few bright pillows. 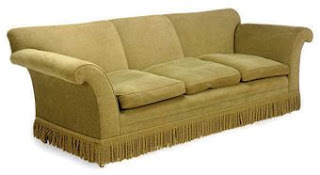 This sofa has an auction estimate of $1,000 - $1,500. This Edwardian satinwood recamier is another notch up the style statement scale. It has a wonderful shape and I could see an elegant lady sitting with her right arm propped on the high end reading a book. This is being offered in the next Doyle @Home auction and has an estimate of $1,000 - $1,500. You may well want something more comfy looking. This sofa sold for the bargain price of $188 at the last Christie's Interiors auction! It needs updated upholstery in my opinion, but is actually a nice shape with the curved arms. 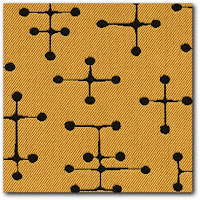 For that price you could invest in a great designer fabric and pillows. For a modern design vibe, this Isamu Noguchi sofa and ottomon would do the trick. They are very space age cool. They were designed in 1946 and reproduced by Vitra in 2002. 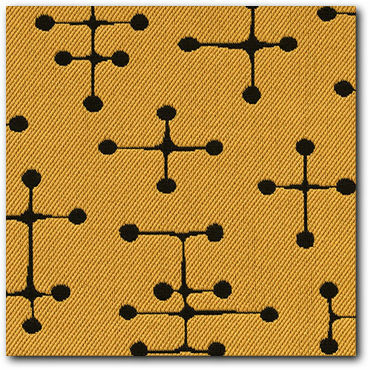 I might like them in a mid-century design fabric like this one in yellow designed by Charles and Ray Eames. 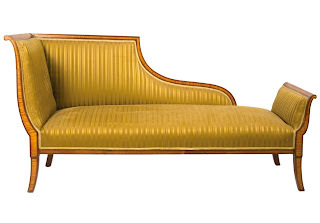 The sofa and ottomon sold at the last Bonhams Los Angeles sale Oct. 5th for $2,074. Check condition, like springs and wear on upholstery. They can be fixed/changed, but it can cost a fair amount. Remember you will need to hire a shipping company to move it. Another expenditure to add. As always at auction, before bidding know what you want to spend (including all the extras like 1 and 2 above) and stick to your number. I've seen used items go for more than buying it new, just because the bidding in the room pushed the price up. But there are bargains too! Your sofa will set the tone of your room. Think about how you want to use it (conversation, reading, just to look at...), and pick your style.